Our 1", Large Size Custom Wooden Dice are crafted from solid maple color wood. 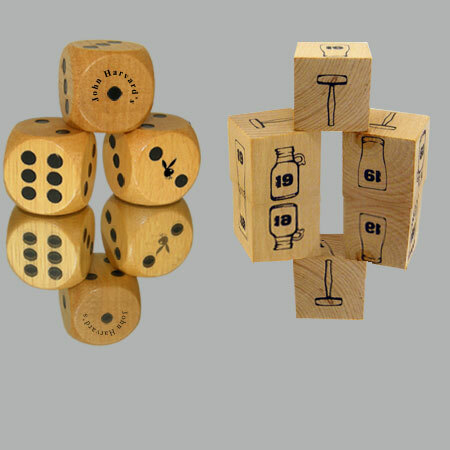 These eco-friendly Imprinted Wooden Dice are great for promotions, games, and much more. You can imprint our Square Corner 25mm Custom Wood Dice with any standard imprint color. One to three color imprinting is available on one to six sides of the dice. The minimum order for One Inch Square Corner Wooden Promotional Dice is 500 pieces per design (250 pair). Our 1" (20mm) Round Corner Custom Wooden Dice are now blank and can be printed with one to three color imprinting on one to six sides of the dice. Imprint area on up to 1/2 inch of each side(see designs below). These Custom Wooden Eco Dice feature either blank imprintable sides or custom printing can be done around printed spots. The minimum order for One Inch Round Corner Wooden Promotional Dice is 500 pieces per design (250 pair). Custom Wood Dice Pricing – Includes Up to 6 Different Full Color Designs on the Sides!